Absolutely fabulous tour with a guide who was passionate about excavation and Herculaneum. He brought it to life, took us through a typical day at the sea resort, discussed life style, and the fabulous architecture. It was a perfect day. I loved this tour! it was one of the highlights of our holiday in Italy. The guide Chiara was the best, you could see she studied it all and that she really enjoyed it. We asked her a lot of questions and she never seemed to mind. She was really the best! Thank you for a life time experience! This was a great tour. 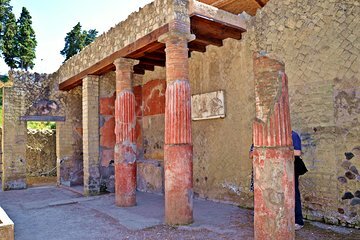 We would highly recommend Herculaneum, with Paolo as a guide. We were very hot and tired when we began the tour, and I did not think I would last long. But Paolo was so engaged with his subject, and so engaging, that we enjoyed every minute. As an archeologist himself, he has a depth of knowledge and interest that could not be matched. Gian Carlo was an excellent guide. He brought the Herculaneum to life and was incredibly knowledgable on the whole area. I really enjoyed every moment of the tour.